AverageBro: Penn State Penalties Imposed. Too Severe, Just Right, Or Misplaced?!? Penn State Penalties Imposed. Too Severe, Just Right, Or Misplaced?!? Penn State was just hit with the inevitable penalties for SanduskyGate. I'm still not totally sure how to feel about this. 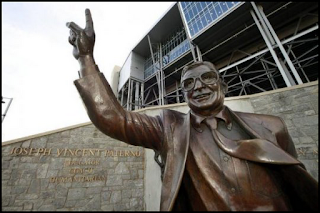 In addition, all victories from 1998-2011 have been vacated, a huge blow to the coaching legacy of Joe Paterno, now formerly the winningest football coach in college football history. The $60 million fine, which amounts fo one year’s gross revenue from the football program, will be used to endow a fund for victims of abuse and to prevent future abuse, Emmert said. Athletes will be free to transfer and retain immediate eligibility. Part of me wonders why the nuclear option wasn't enacted here. If the NCAA truly believes the school was wrong in the coverup, why in the hell are they playing any football this Fall? Wouldn't it send a much bigger message about the importance of a child's game vs a child's innocence if they just scrapped the whole program for a year? While Penn State avoided having its football program shut down, the NCAA’s “corrective and punitive measures” probably will severely affect a school that ranks sixth all-time with 827 victories at college football’s highest level and won two national titles during Paterno’s 46-year tenure as coach. It also will have an immense effect on the school’s finances. In the fiscal year ending in 2011, Penn State’s athletic department generated $116.1 million in operating revenue and posted a $14.8 million operating profit, according to school records. Of Penn State’s 29 sports teams, only football and men’s basketball were profitable last year, with football generating an operating profit of $43.8 million on $58.9 million in revenue. The Nittany Lions had a 9-4 record last season. A shutdown of the football program would have cost Penn State and the surrounding community more than $70 million, according to an economic study commissioned by the university for the 2008-09 school year. That included $51.1 million spent on hotels, souvenirs, food, services and entertainment by out- of-state visitors, which represent about 15 percent of those attending games at Beaver Stadium, which has a capacity of more than 106,500. Penn State has an endowment of $1.3 billion, the Pittsburgh-Post Gazette reported in March, citing Graham Spanier, who was dismissed as university president in the scandal. Question: Should the NCAA have been more severe or is this punishment just right?